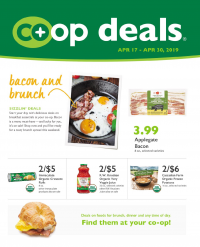 The Co-op Deals Flyer is your bi-weekly savings guide at the co-op, offering great deals on some of our most popular grocery products, with recipes and tips to help you put it all together. 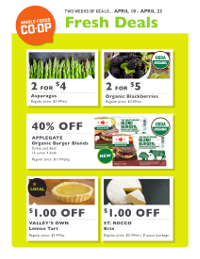 Every Wednesday we roll out new deals, offering deep discounts on select items in our Fresh Departments. Everyday low prices to help you fill your pantry with important staple items without skimping on quality. These aren’t sale prices, they’re here-to-stay prices!